This meal started in a very different place than it ended. In the morning, I suggested to Jan that I make fish that night. Lately, that has meant fish tacos, but I am getting board with that. Jan suggested lobster rolls, but that is too expensive in California. I suggested Langoustine, which are kind of Italian mini-lobsters. When I got to the store, I found no Langoustine and there was not even any lobster. Phone calls to the dear one and we settled on crab. The last time I bought canned crab it was very disappointing. I do not remember the brand, but the can was more than half liquid. 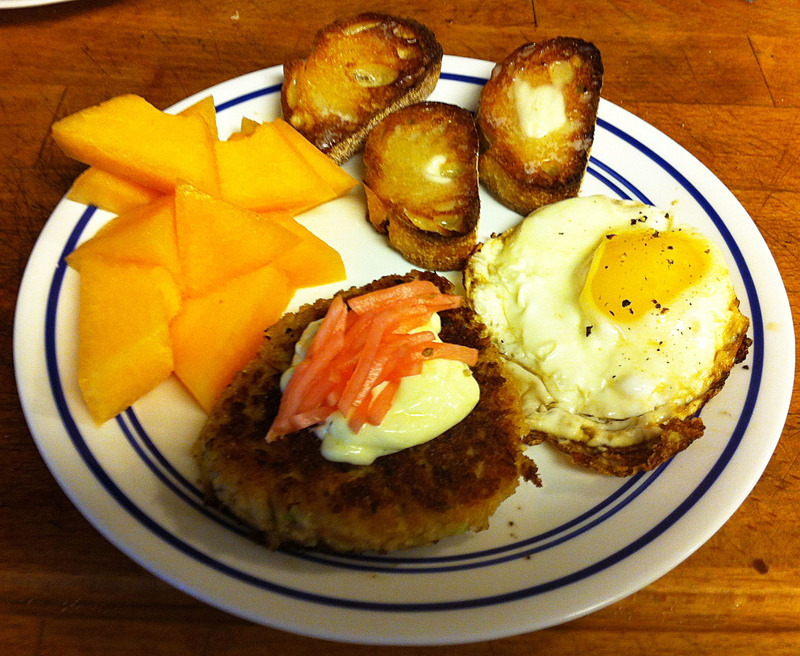 I did not have enough crab to make a decent sized crab cake, so I ended up making mini crab cakes to add to some soup. This time, I bought a pound of premium Chicken of the Sea crab from Trader Joe’s. I figured that if it was half water I would have enough for at least a few cakes. There was only one teaspoon of liquid in the can and a solid pound of crab, enough to make nine good sized crab cakes! For some recipes, you can look at dozens of recipes and they will be all the same, except for very slight changes. If you search for crab cakes, you will find dozens of recipes, all very different. This is a recipe where each cook has followed their own heart on what it should be like. At its most basic, a crab cake is crab, bread crumbs and some kind of binder to hold it together while you cook it. In the basic recipe, the best type of crab to use; fresh or dried bread crumbs; egg, mayonnaise or seafood binders are all options that people have explored. However, most cooks do not stop there—variations in spices, vegetables, and cooking techniques also abound. Many recipes call for as much as a cup of mayonnaise for half a pound of crab. As mayonnaise is almost all oil this is right out for me, as well as sounding completely disgusting. With Jan’s diet restrictions a seafood/egg binder is preferable. Seafood/egg binders depend on the protein myocin, which is released from meat when you mash it up. If you are using beef you try to avoid releasing this protean, because it makes for rubbery meatballs. For crab cakes you want as much as you can get. However, it takes time for the released myosin to form its stabilizing bonds so that the crab cakes will hold together. You must rest the cakes for at least half an hour, so that they can firm up. Jan has asked for real aioli to go with the crab cakes. She may have difficulty with it, because it mayonnaise is just egg and oil and she has difficulties with oil. I will put the aioli on the side so she can take as much or as little as she can tolerate. Although I had not planned to add mayonnaise to my crab mix, I decided that cleaning the blender would be a waste of time and resources. I left about a tablespoon of aioli in the blender when I processed my binders. Many crab cake recipes call for lots of vegetable fillers, because the crab is so expensive. The vegetables do add some color and crunch, but they can be overdone. With my riches in crabmeat, I would add just enough to add interest and highlight the crab. With a bed of spring greens, my crab cakes and the aioli, my dish was almost complete. One recipe I viewed had used shredded red radishes as a garnish. I liked the little white bars with the red tips as a garnish, but I was afraid that the raw radish might be a bit sharp. I decided that a quick pickle in champagne vinegar dressing (an idea taken from another recipe) was just the ticket. After Dinner Note: Nine big crab cakes left two each for dinner and one each for breakfast the next morning. Everybody loved this and I am going to have to make it again. This is definitely a company dish. Note: If you have used your blender to make the aioli do not clean it out. If you did not, just add two tablespoons of mayonnaise in place of the aioli. 1. Place the aioli, shrimp, eggs, Dijon mustard, lemon juice, pepper, and salt in a standing blender and process to a smooth slurry. 2. Put the crab, ½ cup panko, celery, red bell pepper, and green onion in a medium bowl and add the binder from the blender. Tip: You may use any bread crumbs, but I prefer to use panko, because they are neutral and do not add any flavor of their own to the mix. You may feel differently. 3. Gently, but thoroughly, fold the mixtures together. Tip: You want the binders mixed into the crab mixture, but you do not want to break the crab up into a paste. 4. Spread the remaining panko on a plate. 5. Scoop up half a cup of crab mixture and form it into a patty. 6. Gently coat the outsides of the patty with panko and place the cake on a lipped baking sheet covered with plastic wrap. 7. Refrigerate the crab cakes for at least 30 minutes. 8. Fry the cakes in a large sauté, over medium high heat, until golden brown on both sides. Tip: I used clarified butter (ghee), but you may use any oil you prefer. 9. Lay a bed of salad greens on the individual plates. 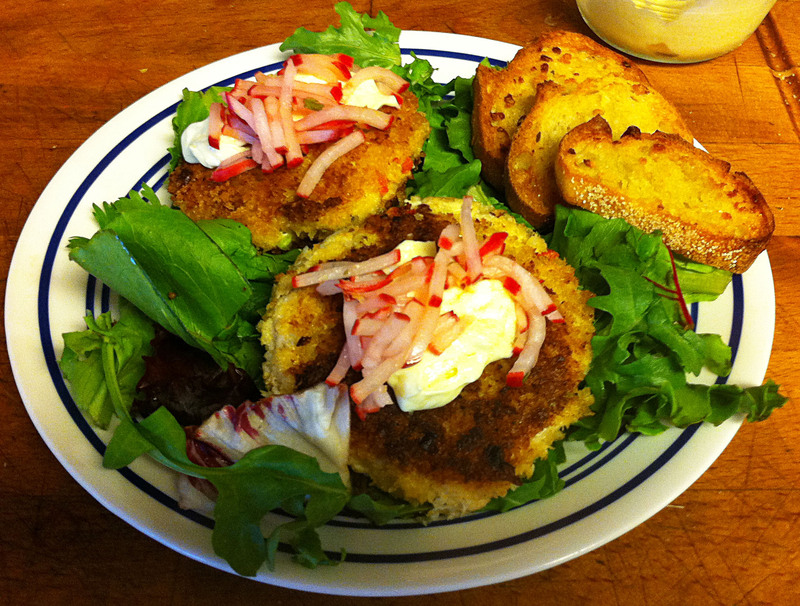 Lay two crab cakes over the greens and garnish with aioli, radish pickle, and garlic toast. Serve immediately.